Posted on Friday, October 12th, 2018 at 9:00 am. Not really into long-distance cycle touring? Prefer half- or full-day rides? That’s not a problem in New Zealand where shorter riding options can be found right across the country. Here are five routes that’ll stretch your legs without raising too much of a sweat. Paeroa to Waikino, 28km return. This section of the trail takes you through the sharply winding Karangahake Gorge, considered one of the “fourteen wonders of New Zealand”. As well as bush, waterfalls and tunnels, this area has a rich gold mining history and there’s plenty of relics to uncover along the way. Three themed trails to choose from, all offering stunning coastal and rural views and relaxed, easy riding. If you love wine, put the Wineries Ride on your agenda – it meanders past numerous award-winning wineries. Or time your visit to coincide with the annual Napier Art Deco Festival, taking place 13 to 17 February 2019. W2K section, Kinloch Domain to Whakaipo Bay, 26km return. This is the most accessible section of the Great Lake Trail. Highlights include towering volcanic rock cliffs, beautiful views of Lake Taupo and a waterfall hidden deep in the Waihaha Valley. 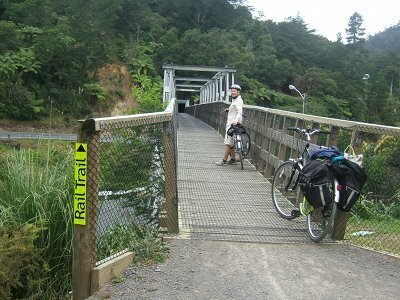 West Coast Rail Trail, Greymouth, 24km return. The west coast of the South Island is an epic spot for a bike ride. This trail runs from Greymouth to Shipwreck Point along an old coastal railway line. Carry on a bit further to Stone Pub for a good lunch stop. 25km (one-way) of smooth gravel riding through the Wakatipu Basin. Add an extra 8km to your journey with the addition of the Lake Hayes Circuit – famous for its calm waters and stunning reflections of The Remarkables mountain range. Sample any of these rides with combined campervan and bike hire. We supply fully-equipped, comfortable campervans in a range of sizes. Add in bikes and you’re all set for an adventure of a lifetime. Take a look at campervan options here. P.S. If you’re contemplating a campervan tour this summer, we recommend getting your reservation in early to avoid disappointment. Vans are hugely popular over the summer months and we book out fast! Check out your options on the website and then get in touch today.